The Dennis DOGs, is a group of former Dennis apprentices and employees who meet annually for lunch at the Wey Valley Bowls Club. The Group is very informal, with no defined aims and objectives, other than members all have an interest in all things Dennis, past and present. The sole function is to provide a focal point and venue for friends and colleagues to meet, socialise and reminisce about Dennis. However, if and when required, it is available to assist in organising events which reflect the history of Dennis. All former employees of Dennis related companies, together with their wifes, husbands, or partners, are welcome to join. The membership is currently around 150. Although the Group is not formally linked with Dennis or the Dennis Society, it works closely with them both. Some members of the organising team during the 2013 lunch with John Dennis. 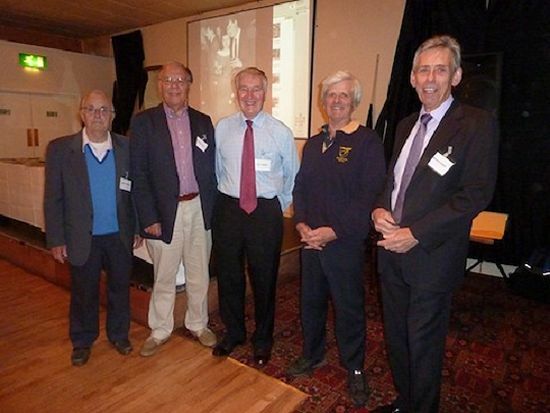 Left to right: John Rogers, John Hillier, Doug Handby, John Dennis and Roger Paice. The Group was founded some years ago by half a dozen former apprentices, who in the late 1950s renovated the former Coventry, 1914 Dennis N fire engine. During the subsequent years they met annually for an informal lunch and chat, referring to each other as Dennis Old Geezers and Gals, DOGs. In 2009 they decided to invite other former Dennis personnel to join and for which there was a great response. With no formality or committee, the lunch is organised by the same half a dozen, who also underpin the administration of the group. 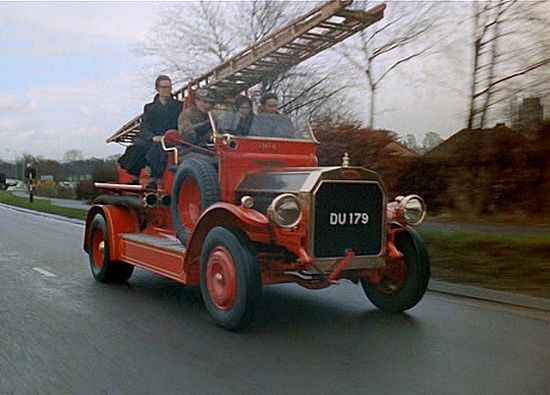 1914 Dennis N Fire engine, following complete renovation by Dennis apprentices, during the 1963 London to Brighton Historic Vehicle Run, driven by Nick Grenside with Doug Handby & others as passengers. To join in and add yourself to our records, please would you forward by e-mail to our organising team, your contact details - postal address, contact phone no(s), when you were at Dennis and a 'one liner' of your employment with them. Also, the name(s) of any immediate colleague(s) that you had when at Dennis would be helpful.